To introduce a wider audience of researchers to this field of inquiry, and to situate our work within existing research, we conducted reviews of previous works that utilized motion capture to study the kinematics of sign and gesture production. We presented the preliminary results from our review, along with comments on technical and methodological issues, as a poster at the DComm conference Language as a Form of Action. Mehmet Aydın Baytaş, Damla Çay, Asım Evren Yantaç, & Morten Fjeld (2017). Motion Capture in Gesture and Sign Language Research. 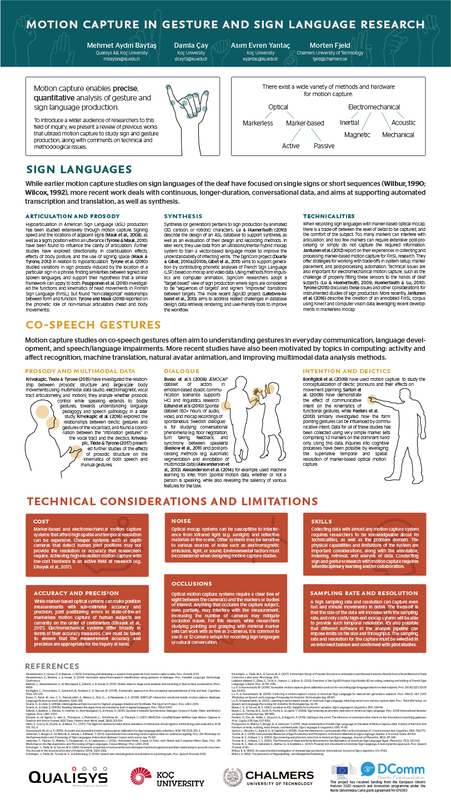 Poster presented at the DComm conference Language as a Form of Action.